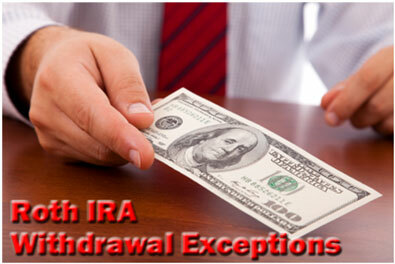 What are the Roth IRA withdrawal exceptions for early withdrawals prior to age 59 ½? Can you avoid taxes and penalties on certain types of withdrawals? While you can always withdraw your original contributions from your Roth IRA tax-free and penalty-free for any reason prior to age 59 ½, in most cases, you will owe income taxes and a 10% early withdrawal penalty if you withdraw investment gains, rollover funds, or conversion funds early. As a general rule, you will owe income taxes on such withdrawals. But there are certain Roth IRA withdrawal exceptions where you may not have to pay the 10% additional tax. One of the Roth IRA withdrawal exceptions we hope you don't have to deal with anytime soon is death. If you die before reaching age 59 ½, your beneficiary or your estate can withdraw the taxable portions of your account without having to pay the 10% early withdrawal penalty. However, depending on the situation, your beneficiary may owe income taxes or estate taxes on withdrawals made after your death. For instance, let's say you die at age 57, and you leave your entire estate to your daughter, including your Roth IRA worth $125,000 - $50,000 in original contributions and $75,000 in investment gains. Your daughter can liquidate the account without having to pay a 10% early withdrawal penalty, and she can withdraw the $50,000 in original contributions tax-free and penalty-free. But the $75,000 investment gain is likely subject to estate taxes and/or income taxes. When your beneficiary is your spouse, your spouse can opt to treat your Roth IRA as his or her own following your death. As long as your spouse doesn't withdraw investment gains, rollover funds, or conversion funds prior to age 59 ½, the IRS will not assess a 10% early withdrawal penalty. For example, let's say you have a Roth IRA worth $150,000, and your spouse has a Roth IRA worth $175,000. Both of you are age 55. Your spouse passes away, and you opt to treat his Roth IRA like your own. In this case, the funds simply rollover into your name, free of estate taxes and income taxes. And as long as you wait until age 59 ½ to withdraw investment gains, rollover funds, or conversion funds, all your withdrawals will be tax-free and penalty-free. If you become disabled prior to reaching age 59 ½, you might want to take advantage of a Roth IRA withdrawal exception to avoid paying the 10% early withdrawal penalty. However, keep in mind, that your defintion of disabled and the IRS definition of disabled may be two different things. You can't simply claim to be disabled and hope to take advantage of this provision. In order to avoid the 10% early withdrawal penalty, you must first meet the IRS standard for "disabled." "You are considered disabled if you can furnish proof that you cannot do any substantial gainful activity because of your physical or mental condition. A physician must determine that your condition can be expected to result in death or to be of long, continued, and indefinite duration." For example, suppose at 37 years old, a car accident leaves you in a persistent vegetation state. In such a scenario a doctor will likely agree that you're unable to perform "substantial gainful activity" and your condition is expected to be "of long, continued, and indefinite duration." As a result, early Roth IRA withdrawals made on your behalf will avoid the 10% early withdrawal penalty. An annuity is another one of the Roth IRA withdrawal exceptions for withdrawals prior to age 59 ½. Under IRS rules, if you make withdrawals from your Roth IRA that are part of a series of substantially equal payments over your expected lifetime, then you can avoid paying the 10% early withdrawal penalty. To take advantage of this exception, you must use an IRS-approved distribution method, and you must make at least one withdrawal per year. For example, let's say your 55 years old with a Roth IRA worth $100,000. Over the years, you withdrew all of your original contributions tax-free and penalty-free, so the $100,000 left in your account represents investment earnings - investment earnings subject to income taxes and a 10% early withdrawal penalty if withdrawn early. One way you can avoid the 10% early withdrawal penalty is to annuitize your Roth IRA, meaning you chose to distribute funds according to an acturial schedule the IRS has produced based on your life expenctancy. In this case, the IRS predicts you'll live another 30 years. So if you annuitize your Roth IRA, you can withdraw up to $3,333.33 in the first year. And you must withdraw the same dollar amount each year thereafter. During the payout period, your withdrawal schedule can not change or you'll get hit with the 10% early withdrawal penalty. Like many Roth IRA withdrawal exceptions, it's a good idea to seek the help and guidance of a qualified financial professional before you annuitize your Roth IRA. Yet another Roth IRA withdrawal exception involves higher education expenses. Even if you're under age 59 ½, if you pay qualified higher education expenses for yourself, your spouse, or the children or grandchildren of you or your spouse, then you can avoid the 10% early withdrawal penalty. Qualified education expenses include tuition, books, fees, supplies, and/or equipment required for enrollment or attendance at an eligible educational institution. Qualified education expenses also include expenses for special needs services incurred by or for special needs students in connection with enrollment and/or attendance, and if the student is at least half-time, room and board are also considered qualified education expenses. An eligibile educational institution is any college, university, vocational school, or other postsecondary educational institution eligible to participate in the student aid programs administered by the U.S. Department of Education. If you're not sure whether an institution is eligible or not, ask them. They should be able to tell you one way or another. 2) The withdrawn funds must be used to pay qualified acquisition costs for the main home of a first-time homebuyer who is either yourself, your spouse, or either of your children, grandchildren, or parents (in other words, a direct line descendant). 3) The withdrawn funds used for this purpose can not total more than $10,000 in your lifetime. If you're considering a Roth IRA first home purchase, keep in mind that the $10,000 lifetime limit is a total limit. In other words, you can give $10,000 to each child and grandchild. It must be a combined total of $10,000. For instance, say you have 4 children. You can provide all four with $2,500 each, or just two of them with $5,000. Or you can give your spouse and each child $2,000 each. But whatever combination you choose, know that once you reach the $10,000, that's it - for life! The Roth IRA withdrawal exceptions also allow you to avoid paying the 10% early withdrawal penalty if you use the funds to cover your unreimbursed medical expenses above 7.5% of your adjusted gross income. To find out how much you can withdraw, take the amount you paid for unreimbursed medical expenses during the year of the distribution and subtract 7.5% of your adjusted gross income in the same year. The amount you're left with is the amount you're eligible to withdraw early without paying the penalty. Let's say you're 43 years old with an adjustable gross income of $100,000 and a Roth IRA worth $60,000. During the course of the year, you incur $10,000 in unreimbursed medical expenses. Under IRS rules, you can withdraw up to $2,500 early without having to pay the 10% early withdrawal penalty. Because your $10,000 in unreimbursed medical expenses minus $7,500 (7.5% of your $100,000 adjusted gross income) is $2,500. Keep in mind that according to the IRS, "You can only take into account unreimbursed medical expenses that you would be able to include in figuring a deduction for medical expenses on Schedule A, Form 1040." But this does NOT mean you need to itemize your deductions in order to avoid the 10% early withdrawal penalty. Needless to say, if you're considering an early withdrawal to cover your unreimbursed medical expenses, seek the advice of an accountant or other qualified financial professional. You may want to take advantage of one of the Roth IRA withdrawal exceptions to if you paid out-of-pocket medical insurance premiums due to a period of unemployment. Under the law, you can avoid the 10% early withdrawal penalty if you withdraw funds to cover medical insurance premiums you paid during the year for yourself, your spouse, and/or your dependents. 1) You lost your job. 2) You received unemployment compensation paid under any federal or state law for 12 consecutive weeks because you lost your job. 3) You receive the withdrawn funds during either the year you received the unemployment compensation or the following year. 4) You receive the withdrawn funds no later than 60 days after you have been reemployed. 1) You were ordered or called to active duty after September 11, 2001. 3) The funds were withdrawn no earlier than the date of the order or call to active duty and no later than the close of the active duty period. Hopefully, you'll never be forced to trigger one of the Roth IRA withdrawal exceptions because you owe the IRS back taxes. Under the law, you avoid having to pay the 10% early withdrawal penalty if funds are withdrawn from your Roth IRA early "due to an IRS levy of the qualified plan." An IRS levy would entail a legal seizure of all or part of the funds in your Roth IRA in order to satify a tax debt. Even though you avoid the 10% penalty in this scenario, it's definitely not a desirable outcome. So make sure you pay your taxes! There are a number of Roth IRA withdrawal exceptions which allow you to avoid paying the 10% penalty for early withdrawals. If at all possible, it's good idea to avoid early withdrawals from your Roth IRA, since any funds withdrawn can no longer grow tax-free and compound for your retirement years. But if you're intent on taking one of these withdrawals, make sure you consult with a qualified financial professional so as to avoid any costly mistakes!